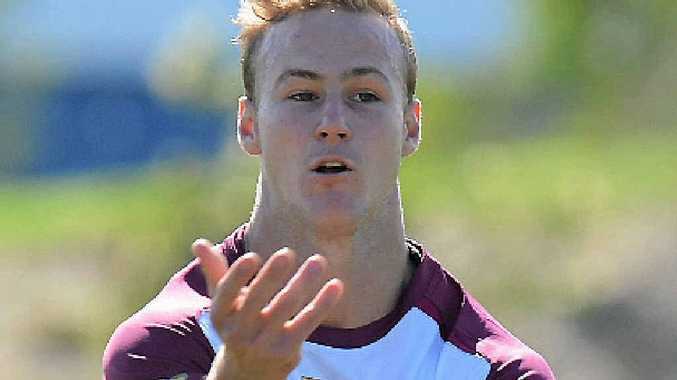 THE clock is fast ticking and it is set to deny Queensland halfback Daly Cherry-Evans a spot in Wednesday night's second Origin in Sydney. Cherry-Evans was supposed to train in an opposed session against the Queensland under-18 team at Sanctuary Cove on Saturday. Instead he iced his troublesome knee on the sidelines, while Broncos playmaker Ben Hunt ran at No.7. Maroons players and officials are still hopeful he will play. But it was not all bad news, as it emerged Greg Inglis was likely to play and be cleared of an ankle injury he suffered for the Rabbitohs against the Warriors in round 13. Billy Slater reportedly ran confidently at fullback but again opted against testing his shoulder against tackle bags over the weekend. Cherry-Evans's Manly teammate Anthony Watmough said the Blues have been preparing as if the halfback will play. But it is appearing likely that Hunt will be given his debut by the Maroons. Queensland back-rower Sam Thaiday admitted it was risky leaving Cherry-Evans' selection until the final moment. "There is somewhat of a risk there leaving it late," he said. "But in saying that we have been preparing like they haven't been playing." Blues enforcer Greg Bird was not buying into the talk that the injury-hit Maroons will not be at their best. "I'm sure they're trying to lull us into a false sense of security that we're going to come up against a team that's a bit under the weather, but we know better than that," he said.